The LUO Brothers comprises three brothers, LUO Weidong (b.1963), LUO Weiguo (b.1964) and LUO Weibing (b.1972) from Nanning in Guangxi Province. Born during the Cultural Revolution (1966-1976) they experienced growing up in a China that was gradually changing before their eyes, both politically and culturally. In the mid 1990s a number of artists started to employ symbols of both traditional Chinese and Western consumerism in their work, by means of garish, loud colours, with references made to everyday peasant lifestyle. The term given for this style of work was 'Gaudy Art', ('yansu': 'yan' - garishly coloured and 'su' - common or vulgar) suggested by LI Xianting, a prominent critic and curator in China, who was trying to distinguish the style from the western term 'kitsch' - a word which had only entered China during the 1990s through the translated works of Milan Kundera. Gaudy Art was more a satire on kitsch, a questioning of Pop, and (in the case of the work of the LUO Brothers) valued quality of technique in lacquer. LI Xianting explained '…artists strove to infuse their works with the taste of China's peasantry for gaudy objects, either through their use of colour or popular images …..to raise awareness that the essence of peasant taste is what lies at the base of today's consumerism.' (p78). Gaudy Art developed from such styles as Political Pop and Critical Realism which were arising in China during the late 1980s and early 1990s. Significantly, the visit to Beijing by Robert Rauschenberg for an exhibition in 1985 was to markedly alter contemporary art discourse in China. LI Xianting further attributes Gaudy Art to being strongly influenced by American artist Jeff Koons, whose works were also seen in China in the late 80s and 90s. 'Welcome the world famous brand' is a lacquer and collage work depicting at one instance those symbols of a traditional China, peasant life and harvest festival. 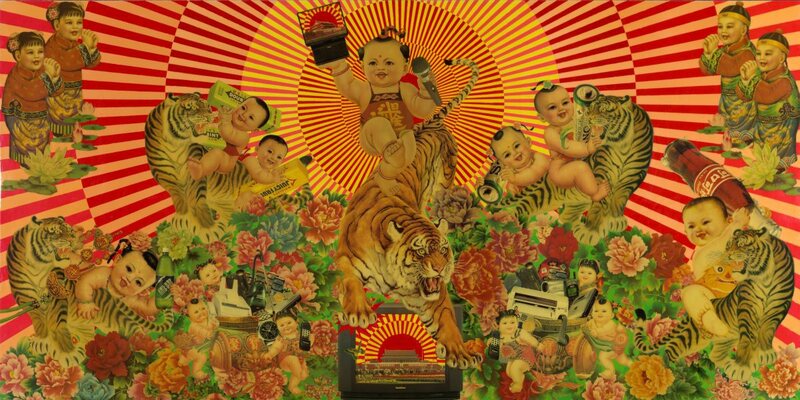 The predominant image of the tiger, often a symbol of power and courage, and sometimes represented as the God of Wealth, are flanked by a prolific number of chubby, rosy cheeked children once popular on calendars and propaganda posters. Other symbols include the peony flowers (symbol of noble status and wealth) upon which children are standing, carriages full of gifts, even the Gate of Heavenly Peace, the centre of the capital city, Beijing (in a TV set). Juxtaposed and intermingled with such 'Chinese' symbols are the objects of Western consumerism, which have progressively entered the mainstream economy of China. Products such as Coca-Cola, Sony batteries, television sets, mobile phones, watches, faxes, Wriggly chewing gum etc. What we are confronted with is a pandemonium of both Western capitalism and Chinese traditional culture mixed together in an ever more globalised, unsightly world. In effect the work itself is a parody of a well balanced, glossy type advertisement. The LUO Brothers are internationally recognised and have been included in a number of exhibitions and biennales. For example: 24th Sao Paulo Biennale 1998; Fukuoka Art Museum Collection Exhibition 1999; Mahjong: Contemporary Chinese Art from the Sigg Collection, 2005/2006 (at Kunstmuseum Bern & Hamburger Kunsthalle). LI Xianting, The pluralistic look of Chinese contemporary art since the mid-1990's in 'Chinese art at the end of millennium: Chinese-art.com 1998-1999', (ed John Clark), New Art Media Limited, 2000. 'Mahjong: Contemporary Chinese Art from the Sigg Collection', Hatje Cantz, 2005, 174-175. Nixi Cura, 'High Art, Luo Art', for the Luo Brothers: Welcome the World Famous Brand, Mandeville Gallery 27 March-18 May 2003. Alexa Olesen, Brothers in art as Well as Life, 'The New York Times', 29 October 2000. Asian Art Department, AGNSW, 2006. Jane Somerville, Look , 'A Passion for Art', pg.10-11, Sydney, Sep 2006, 10 (colour illus.). Look , Sydney, Jul 2007, cover (colour illus. ), 9 (colour illus.). The colour illus. on the cover is a detail of this work. Jill Sykes (Editor), Look , Sydney, Dec 2010-Jan 2011, 47 (colour illus.). 'Innovasian: Asian art from 1960 to now' by Jackie Menzies, p.47.